What a lovely evening! 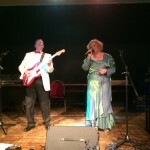 A huge thanks to Rob and Linda Barnard for the wonderful music they supplied. The Ystrad Fawr Juniors Formation Team were exceptional ( 6 times British Junior Champions) as well as the wonderful Ballroom performance by Lloyd and Rebecca, British Junior Champions. We raised £161 from our raffle and this will go to Ward D4 – Stroke Unit at Ysbyty Cwm Rhondda, Llwynypia. Well done everyone and Thank you!